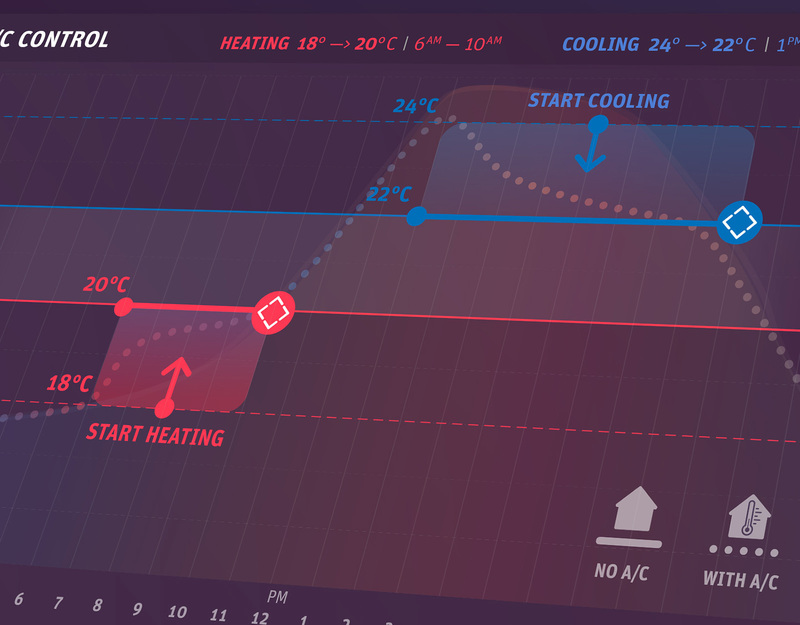 We developed a graphical UI and user experience concept for Logitech’s smart control suite, which can be easily hooked up with their smarthome station (Link). With the challenge to control and manage an increasing number of interlinked smart home devices – potentially many dozens – we explored more practical ways how one could intuitively (also simultaneously) identify as well as control a plethora of devices on the small screen estate of their smartphone or tablet. 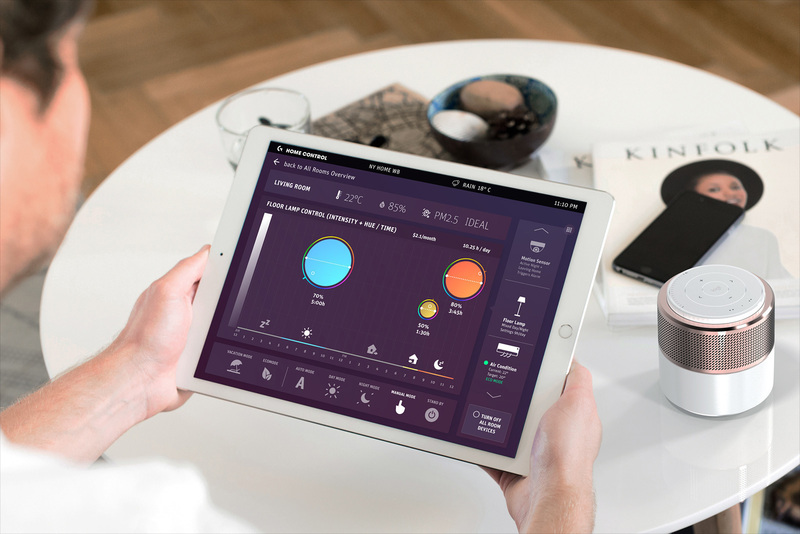 Initially, our UX research revealed that many of the available smart-home control apps were strongly focused on parametric or technical information, not meaningfully processing the output for intuitive human understanding. Also, graphical arrangements or lists of different devices, programs and settings seem too often prioritised in irrelevant ways, which seemed confusing from a user perspective. 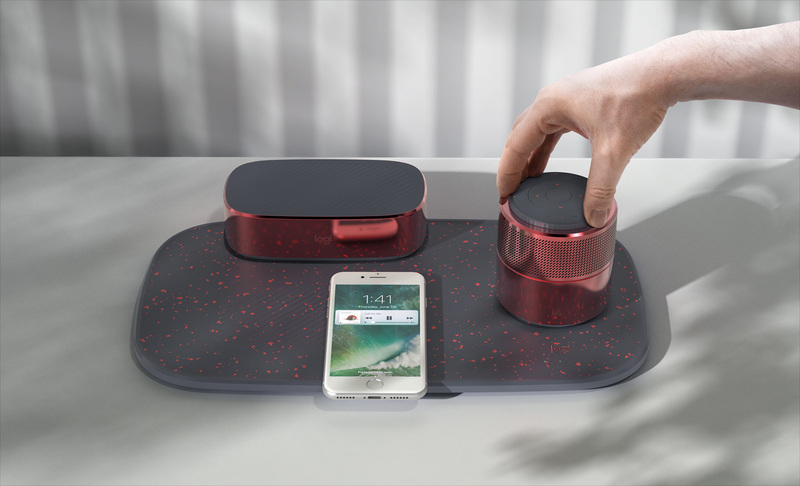 Photo-realistic images of each smart-home device (appliances, consumer electronics, sensors, home security) seemed to be a viable solution in providing familiar visual clues to the user, yet this would have cluttered the UI beyond clarity, in particular when flipping through a large number of smart home devices. Eventually, the most intuitive sense-making solution that materialised was also the most perceptible: Provided with the ability to take panorama photos of their rooms, users can place customisable icons of each connected smart home device into these interior shots, each distinctively named in order to ensure optimal familiarity. 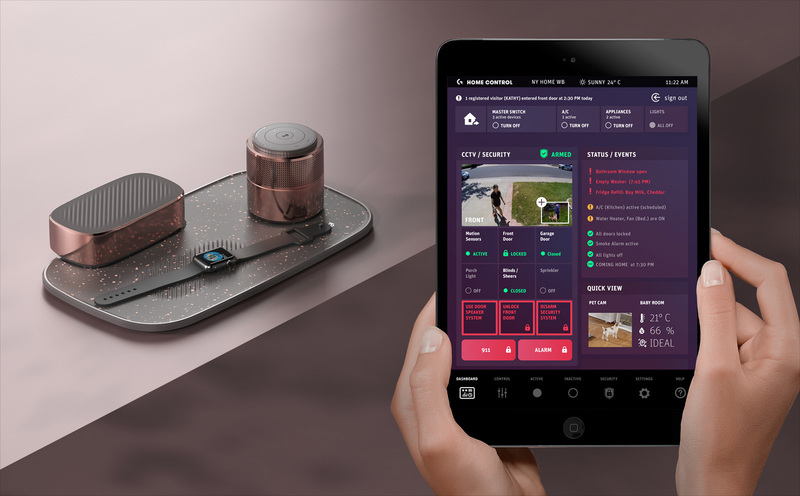 What we did: We designed the app around various day scenarios such as ‘waking up’, ‘leaving home’ or ‘evening’ mode, allowing quick access to crucial settings relevant to one’s daily routines and schedules. 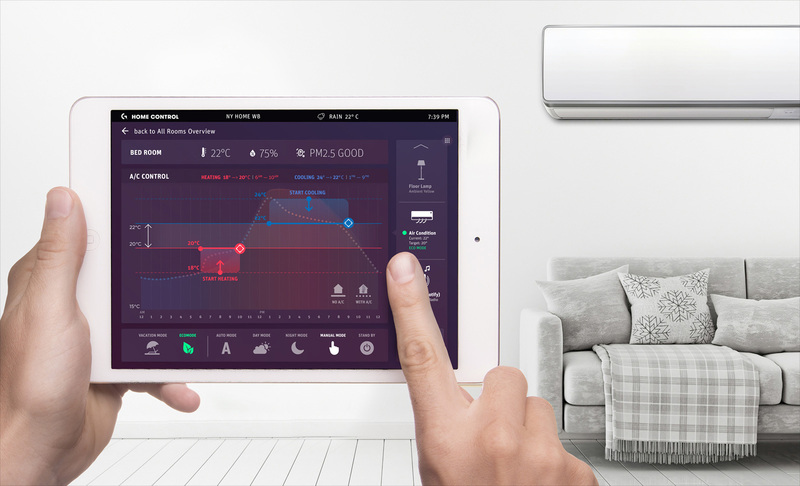 Users can simply customise these scenarios, adding routines such as climate control or programs such as scheduling one’s robot VAC, automating the pet feeder or periodically turning on room lights while on vacation. Controls for lighting, climate control, entertainment and security are kept simple, yet powerful, not just providing ample of helpful presets but intuitive drag, tap and touch controls for manual device management. Making device management as practical as possible, local devices can be grouped into zones (i.e. downstairs, upstairs) or affiliated to rooms, also sorted after type, function or activity. Device icons manually placed in real interior photographs ease the learning curve (bypassing the need to abstractly memorise each icon), yet also add a direct familiarity to one’s home setup. Color coded to indicate various operation modes or status readiness, the responsive icons also help users to conveniently identify devices in need of manual maintenance or further input. 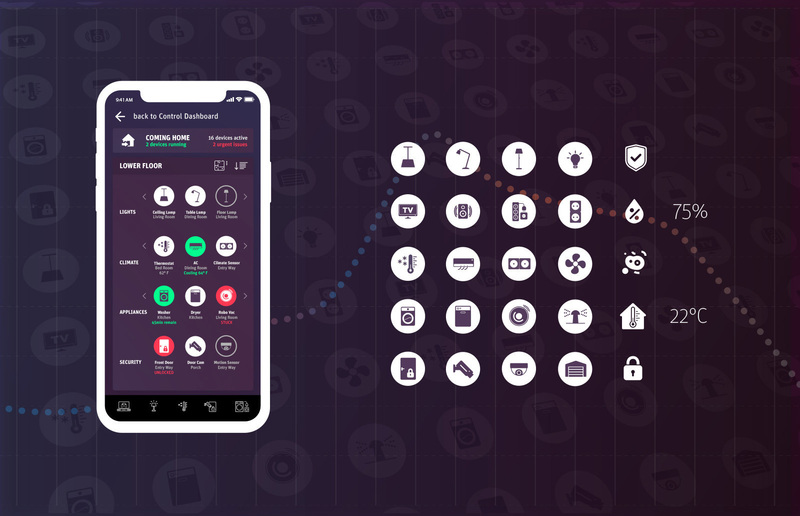 The combination of familiar room photographs, customisable icons, shortcuts and frequently used routines makes smart home management intuitive, shunning cryptographic floor plans or lengthy lists of abstract device icons, which may be confusing if similar devices use the same icons. All strings are pulled together in the dashboard. The fully customisable user interface empowers users to supervise everything from front door security, CCTV, door speaker system (i.e. parcel delivery response) or automation of connected appliances.